Riding with a pet in the car is just another distraction that can lead to a serious or fatal Massachusetts car accident, according to a recent report in the Chicago Tribune. Studies suggest it is an increasing danger as dog ownership — and particularly the popularity of small lap dogs — continues to increase. The Humane Society of the United States reports that dogs are now in about 40 percent of all U.S. homes. While the government has waged all-out war on text messaging and cell phone use by drivers, the distraction of a dog in the vehicle can be just as dangerous. A recent AAA survey found that two-thirds of dog owners frequently pet their dogs while driving — some even feed or water their pooch while driving down the road. “As about 40 percent of Americans own dogs, we see this as an increasingly big problem,” said Beth Mosher, spokeswoman for AAA. An 80-pound dog exerts more than a ton of force (2,400 pounds) in the event of an accident. And an unrestrained dog is frequently killed in a traffic collision. Just this week, the Taunton Daily Gazette reported on the case of a woman who was critically injured in a car accident. Her Pomeranian named Molly did not survive. Another significant issue is the fact that dogs can become extremely territorial inside a wrecked vehicle, making it difficult or impossible for emergency crews to render aide. Officers on the scene have had to kill dogs so that rescue workers could tend to injured passengers inside a vehicle. The recent survey conducted by AAA and Kurgo, a pet-restraint systems manufacturer, found that 55 percent of all pet owners ride with their pets in the vehicle. Twenty-one percent admit to riding with their pets in their lap. 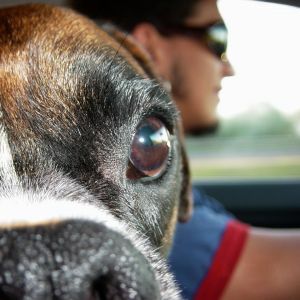 Seven percent acknowledge providing their dog with food or water while driving and 5 percent let a dog sit in their lap while behind the wheel. The National Highway Traffic Safety Administration reports that it takes only two seconds of distraction to cause a serious or fatal car accident.